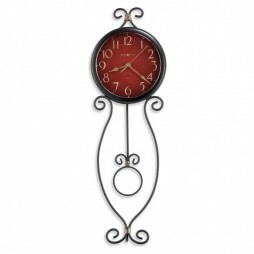 This charming 18″ diameter metal wall clock features an oil-rubbed bronze finish. Designed to be used indoors or outdoors and includes a glass cover and rubber seals to protect the inside of the clock from inclement weather. The off-white dial is highlighted by easy to read black Arabic numerals, a thermometer for temperature, a hygrometer for humidity, and black hour and minute hand. When using outdoors, we recommend hanging your clock in a protected area. 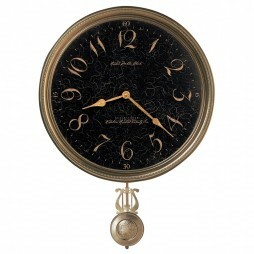 Give your home a modern yet classic look with this antique black and gold metal wall clock. Curved bezel beneath the dial complements the beauty of the timepiece. Open circle pendulum bob with perfect finishing is another star to the grace of this piece. Antique red dial with Arabic numerals and antique spade hands will brighten the room. 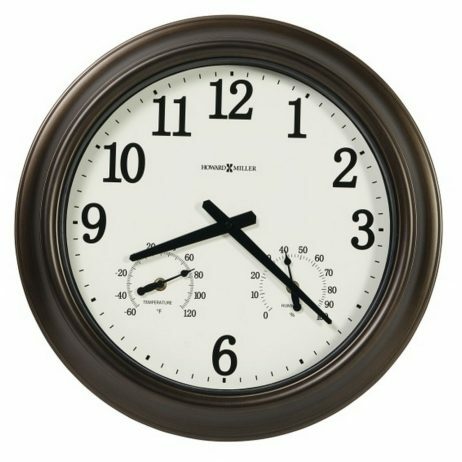 What could be easier than a quartz, battery operated wall clock; just add batteries, set the time and you're good to go. This wall clock is perfect fit for nearly any room in the house. Looking for a unique and decorative pendulum wall clock to hang in your living room or office? 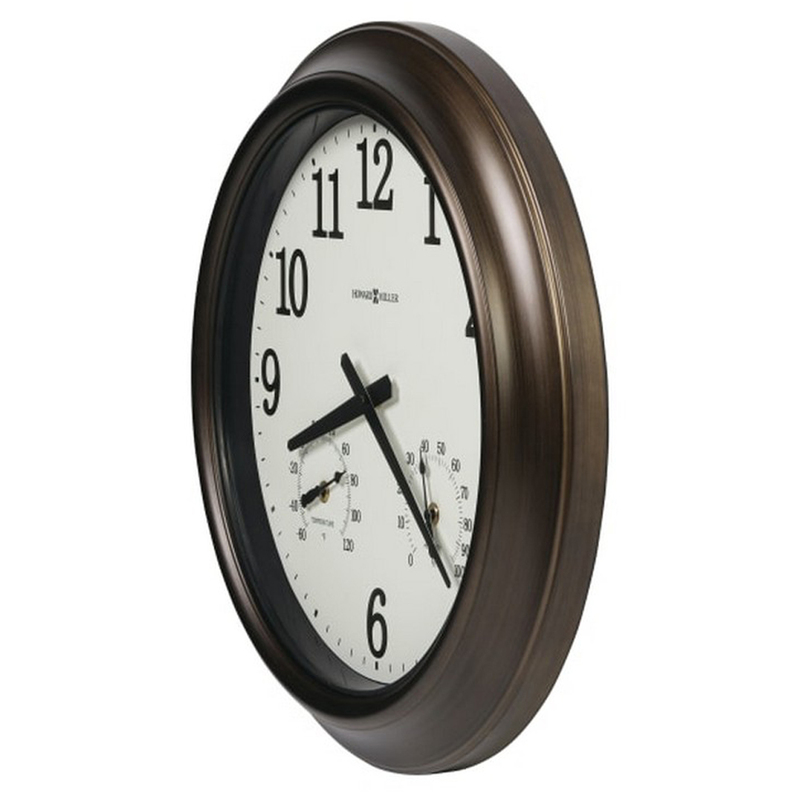 This Moment in Time clock will make a perfect antique addition to your home! This wall clock's dial is elegantly framed in a brass bezel as a decorative antique brass-finished pendulum swings below the elegant clock. This is a battery operated clock with a nice antique brass finish. A beautiful clock for anyone looking to add an antique charm to their home. Oversized polyresin wall clock. 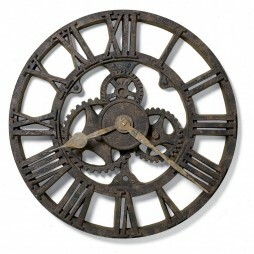 The character of a rusted, antique timepiece is evident in this 21″ molded polyresin wall clock. Aged hour and minute hands add to the appeal of the authentic look. This is a large contemporary wall clock with a beautiful state-of-the-art design; making this wall clock a true work of art. A nice Merlot Cherry finish compliments the brushed nickel-finished pendulum, bezel and the side bars of the clock. This contemporary styling features a crisp white dial with black bar hour markers; along with black hour and minute hands. This modern timepiece was made using select hardwoods and veneers, created with a design like no other. This is a unique wall clock with stunning features you can't miss. 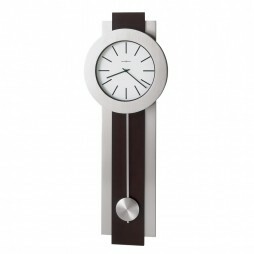 A perfect wall clock to help create a contemporary-style look to your home or office.